SARAHLOUISE Owens, soprano, Vanessa Driver, violin and Ariana Odermatt on harpsichord performed music of Couperin and Rameau and excerpts from the French composer Pierre Gillier’s “Livre d’airs et de simphonies mélez de quelques fragmens d’opéra” from 1697, which was a world premiere. The stately and simple music in the “Suite No 1” by Pierre Gillier remained gentle and light throughout. These placid songs were nicely balanced by the three performers, none overpowered the other, which created a delicate balance as the harpsichord has little volume. Owens passion for early music was evident in her sensitive performance and her subtle, but also at times commanding theatrical gestures. 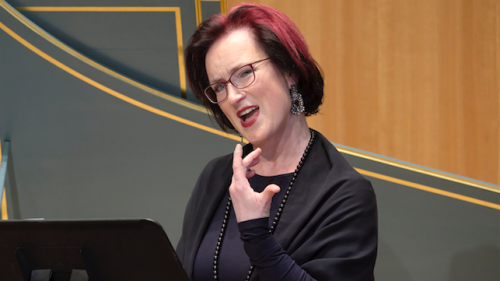 With a significant and extended career in musical performance, Owens also teaches and conducts community choirs in Canberra. After the first suite by Giller, three-pieces for solo harpsichord “Sixième Ordre” by François Couperin. Odermatt can make the trickiest pieces look simple. She has a good grasp of the style of this courtly music. This pleasant and tender suite, one of the 27 he wrote, or Odre as Couperin called them, was evenly balanced in tonality and played with an affection for the style. Jean-Philippe Rameau’s song “Tristes apprêts” from his opera Castor et Pollux is as Owens described it, “the saddest song ever”. Full of the deepest melancholy and sorrow, the song sings of a heart that knows of the death of a loved one and renounces God as the hurt is so great. It was performed with such delicate touches and sensitivity the whole audience could feel the singer caught in the song. Rameau’s air “Viens Hymen” from his opera-ballet Les Indes galantes while sung with as much passion as the “Tristes apprêts”, is a story of tender moments with only the slightest of accompaniment on harpsichord. Two more pieces of Couperin’s “Sixième Ordre” showed more of the perfectly stylised music that is so fittingly composed for the harpsichord by this master of music. All pieces were played with a sympathetic insight. The greater colour in the “Suite No 2” by Gillier, which is from his book of tunes and symphonies mixed with some fragments of opera, sounded more complex than the first suite. The tonal variations and weightier structure brought out a greater depth from the performers. They seemed to have warmed into the music more and the accompaniment from Driver on violin had an ear-catching tone. This was a highly enjoyable performance. The delightfully playful gestures from Owens added much to the character of the concert. This reviewer hopes that in 300 plus years the music of today will be performed with such dedication and spirit.